All motoring clubs and owners of classic & historic motor vehicles are invited to participate in the event. The AOMC (Association of Motoring Clubs Inc), is arranging a cruise and picnic to Yarra Glen racecourse. 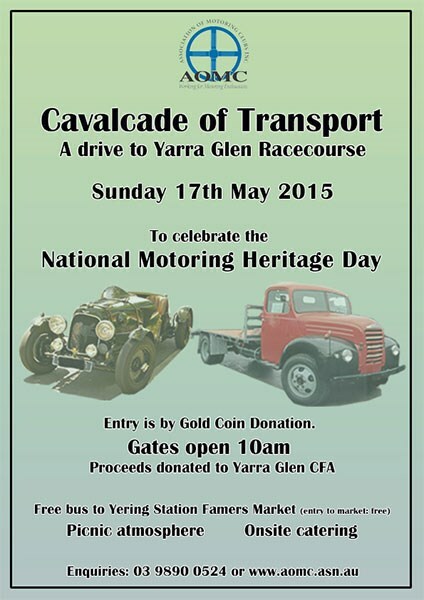 Gold coin on entry, which will be collected at the gate from the Yarra Glen CFA. Catering will be available on the day from local community groups. Travel with your club or make your own way to the Racecourse (see map below). There is a large Sunday market at nearby Yering Station a shuttle bus has been arranged to take visitors to the market via the main street of Yarra Glen. Entry to the market is free.